Great food, live music and rock 'n roll memorabilia. Hard Rock Cafe Anchorage serves up fresh, made-from-scratch menu items from Legendary Burgers to in-house smoked barbeque and local Alaskan cuisine. Rock out with Anchorage at the lively Hard Rock Cafe in downtown Anchorage. Known for its support of live music and hip service, meals at Hard Rock Cafe Anchorage promise more than just tasty food. 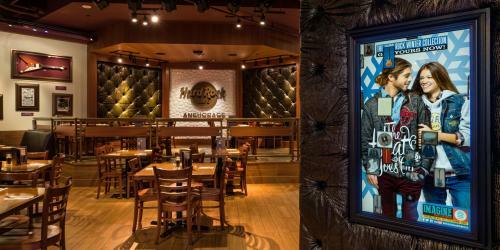 Hang at the bar or enjoy a full meal of fresh, made-from-scratch menu items from classic American cooking to local Alaskan cuisine, at one of the world’s top dining and entertainment brands, surrounded by rock’n’roll memorabilia adorning the walls. Stop by our Rock Shop to start or add to your collection of Hard Rock t-shirts, glasses and souvenir pins. Create great memories and experience great food, great service and a great environment at Hard Rock Cafe Anchorage!